What’s sweet, fruity, bubbly, and destined to rival your neighborhood double-tall-non-fat-no-whip-cream-mocha? Bubble Tea (also called boba tea, tapioca tea, boba nai cha, pearl tea, milk tea, bubble drink, zhen zhu nai cha, tapioca pearl drink, momi, momi milk tea, QQ or any combination of the above)! 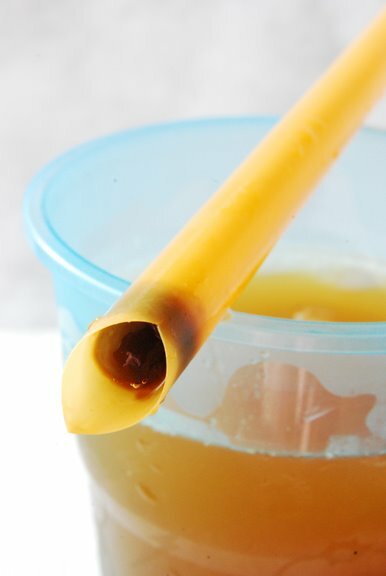 It’s a tea-infused milky or fruit-flavored cold drink that’s a drink you can eat. Bubble Tea originated in Taiwan in the 1980s where legend has it that a local tea establishment attracted customers by combining fruit juices with chilled tea. According to Bubble Tea Supply, a Hawaiian company, elementary school children would look forward to buying a cup of refreshing tea after a long, hard day of work and play. Tea stands were set up in front of the schools and would compete for business with the best selling tea. 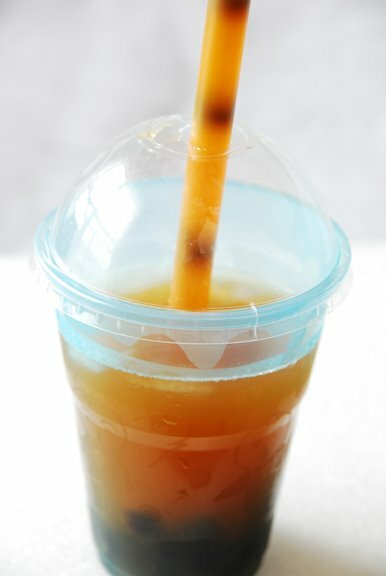 Today, Bubble Tea is spreading quickly from Taiwan to other parts of Asia and to North America. The bubble in Bubble Tea refers to two things. First, small bubbles are created since the drink is shaken in the ever-trendy martini shaker before serving. In addition, bubbles in the form of tapioca balls can be added to the drink. These chewy tapioca balls (or pearls or Boba) are derived from the starch of the cassava root, and they taste like a grown-up gummy bear. They are about the size of a marble and are high in fiber and full of minerals. They are generally translucent brown with a darker brown center, although you can get rainbow, green, and coffee pearls to spice up your tea. 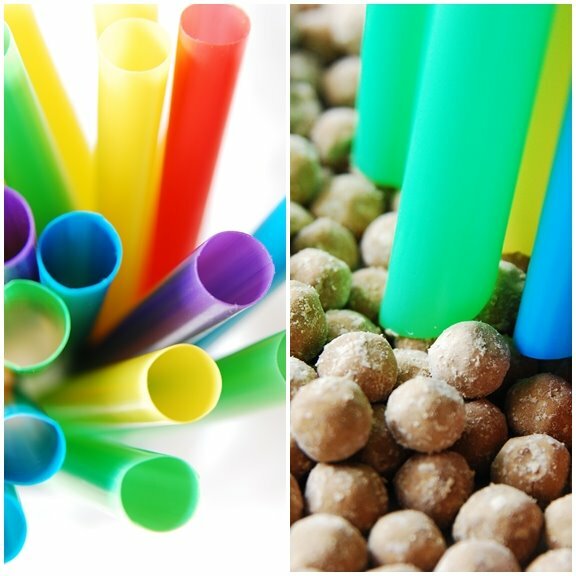 As you sip your drink, these bubbles travel up the wide straw. The texture, taste, and chewy sensation makes you want more! There are a myriad of choices when you order a Bubble Tea. Do you want green or black tea? What flavor of Bubble Tea do you want? Some places offer up to 27 different choices. Do you want tapioca balls, and if so, do you want green, rainbow, or the regular black pearls? How about extra pearls? Do you want a slush, a sherbet, or an ice cream float version? Do you want to add small cubes of jelly, such as coconut or lychee jelly, for a different combination? You can even have it hot or cold. From university campuses to neighborhood cafés and upscale restaurants, bubble beverages have become the trendiest drinks on the menu. Once you're addicted, you may not want to venture out every time a craving hits. With a little preparation, you can make it in the comfort of your home. You will need tea, sugar syrup or honey, tapioca balls, flavoring (either in powder or syrup form) and creamer for the milky teas. For the tea part of the experience, you can use green, oolong, or black tea, such as Darjeeling, Ceylon, or Orange Pekoe. (Black tea is commonly known in some Asian cultures as red tea.) Tea adds a depth, complexity, and smoothness to the Bubble Tea. Also, recent studies have credited tea for doing everything from preventing cancer to promoting a healthy heart and curbing arthritis. As well, green tea contains high amounts of powerful antioxidants called catechin polyphenols. All this healthiness offsets the calories, in my opinion! Pour ingredients in a large pot. Cook (without stirring) at medium to high heat until the mixture boils. Remove from heat. Cool and store refrigerated. You can buy the tapioca balls in several of the grocery stores in your local Chinatown. These stores also sell some of the more popular powdered flavoring (such as strawberry, mango, and lychee). You can also order the tapioca balls and flavorings from a Canadian online Bubble Tea website. As well, they sell the wide straws and cups if you need them. Bring water to boil. Once the water is boiling, pour in tapioca balls. Boil for 30 minutes. Remove from heat and let sit for another 30 minutes. Strain and rinse with water. Store in a container with 2 tablespoons of sugar syrup for up to 3 days in the refrigerator. Now that you have the "mise en place" done for your Bubble Tea experience, you can put it together. Shake the first four ingredients in a cocktail shaker. Bring some water to a boil in a kettle. Measure 2 tablespoons of tapioca balls into a microwave-safe container. Pour boiling water on top of the tapioca balls to cover. Microwave for 1 minute. Strain the tapioca balls and pour into cup. Add some ice. Serve with a wide straw and enjoy. For a bit of fun, add 1 ounce of rum. You either love or hate Bubble Tea. The tapioca balls are delicious and chewy, and I always add more bubbles than I should since I love them so much. However, one friend I served it to passed it along to his wife since he found the texture of the bubbles disgusting. Send the bubbles my way ... I love them! I adore bubble tea, and have definitely found in my life that it's a love-it-or-hate-it thing as well. I've never thought about making it at home until now though. Adding this to my to-do list! Thanks Shari! Your bubble tea is a favouite of mine, great post! I love the picture with the 3 pearls in motion and that picture of the straws is soo neat! I love, love, love bubble tea!! And I would absolutely put extra bubbles in it. The chewiness is great. I'm a sucker (no pun) for the taro-flavored kind. There's something oddly fascinating yet creepy about the texture of those bubbles in bubble tea. What an intersting post! Yay, bubble tea! Oh, awesome! Thanks for the recipe -- I've tried making bubble tea at home and it's never been quite right. I love it and there's nowhere nearby to get it, so I'll be picking up supplies soon. I'll let you know how it turns out! I've never tried bubble tea.. sounds delicious! where did this idea come from? I have never had it before,...looks tasty though! Goshh I so want to try this! I'm gonna hunt out tapioca balls, I'll let you know if I find some! Luckily I can find it locally here in Britain with a wide choice (about 10-15, that's good enough for me)! I've never seen the tapioca balls on sale, but i'll have another look, since it's such a good idea to make it at home! fabulous photos Shari! I'm quite partial to grass jelly noodles or pandan noodles. I have never hear of this but it sounds so tastey! My husband and I love bubble tea! My favorite is the taro root flavor. What a fun idea to make it at home!! I love bubble tea esp passion fruit falvour! Those chewy bubbles are my favourite! I've never had bubble tea but I hope to try it someday. I can take care of some left-over pearls as well! I love them so much! Where did you get the giant straws?!?!?! I want some!! Oh yay - I've always been so curious about bubble tea. I'll have to try this! I love bubble tea!! How clever of you to make it yourself!! I wish I could get my hands on some tapioca pearls... Great post!! Bubble tea is something I've always wanted to try, but for some reason never had. It sounds like it would be fun to make. I can hardly believe that you posted this - I have a bag of these giant tapioca pearls sitting about, I love bubble tea, and I had no recipe. Thanks so much for this great post. Thanks so much for posting this! I love bubble tea and it has been so long since I've had it. There was a place on my undergrad college's campus where we got it all the time, but it has been (yikes! )almost seven years! I've been tempted to make my own, but haven't tried it yet. Looks like I can do it now. Love your photos as well. Oh my gosh.. my daughter and I were HOOKED on Boba! I had moved to Reno Nevada for 1 year and they opened a "Tapioca Express" that served every type of bubble tea you could think of! We moved to the North Bay SF area since and they don't have anything like it.. I miss it! Thank you for your article reminding me of it! It's fun to see how much others love it too! ADDICTIVE STUFF! I had a friend who loved this stuff and talked about it all the time. I've never tried it though. Glad to know I can make it at home. My spouse is a bubble tea lover and I would love this recipe! Thanks for the I interesting post. I've nevr heard of bubble tea but this looks like fun thing to try with a group. Now, that's not something I would ever have thought to make at home. But, it's brilliant! LOVE the chewiness of tapioca!! I had this in Taiwan in 1997 at one of the night markets. It was delicious, but I was frustrated that the pearls would clog up my straw. Thanks for a trip down memory lane! I think the giant straws are half the fun of bubble tea! I found that unless the tapioca balls are specifically for bubble tea they really don't work well. I tried some large white tapioca balls and they just fell apart while cooking. Then I bought some official bubble tea tapioca and it was a great success. Yummy Yummy Yummy!!! I love bubble tea and thanks to you I can make it all summer long. It's a very fun and playful drink that leaves me with a silly smile on my face :)I can't wait to get my supplies! I must say that I prefer the coconut jelly pieces in passion fruit and lychee flavors over the tapioca balls.Thanks for the tutorial. I’ve never tasted bubble tea very interesting article...to try it when is possible. I love buble tea! Haven't had it in a while and now that I have a recipe (thank you) there is no reason not to give it a try. Thank you for sharing! I love bubble tea. I first had it China almost ten years ago. I would never think to make it at home- so cool! Although I've never had it, I sure am tempted to try bubble tea... It sounds like a lot of fun, but I'm honestly a bit scared I would end up choking on the tapioca pearls! Oh.My.God. I love BUBBLE TEA!! They're originally a Taiwanese treat and they exploded here in Singapore nearly 6 or 7 years ago... I remember drinking this when I was 16. Thx for the recipe, I can not wait to try this!